Billiard Table Custom Wood – This designer custom pool table is handcrafted from solid wood. The legs are hand carved from solid blocks of wood, enhancing the table’s overall natural appearance. This billiards table exceeds the equipment standards specified by the Billiard Congress of America. It is regulation size, with a playing field of 44″W x 88″L and features a 3/4″ thick, three piece Italian slate bed. The 5 3/4″ wide rails are created from cherry wood and have hand beveled edges and beautiful mother of pearl inlaid sights. The highest quality K-66 profile cushions and tournament felt have been used in creating this custom pool table. The pockets and baskets are designed to BCA specifications and are created from the highest quality, fine grained leather with braided tassels. The base is designed from exotic cedar that has been reinforced with a steel framework. The bottom of the billiard table legs feature a 3 1/2″ wide hand forged and hammered iron band that has been patina finished. Special mar-proof leveling feet have been used to ensure accurate leveling of this designer pool table. All wood surfaces are hand finished using a 10-step process. This custom pool table is shipped to your location ready to be set up and leveled by a qualified professional. We work with dealers, builders, interior designers, and direct consumers to create custom made furniture for your residential or commercial property. Our handmade pool tables and custom game room furnishings are available in any size, style, and finish by our American craftsmen, hand made using old world techniques to create a luxury fine art furnishing for your project. All hand crafted, solid wood furniture pieces are built using full length, solid wood. 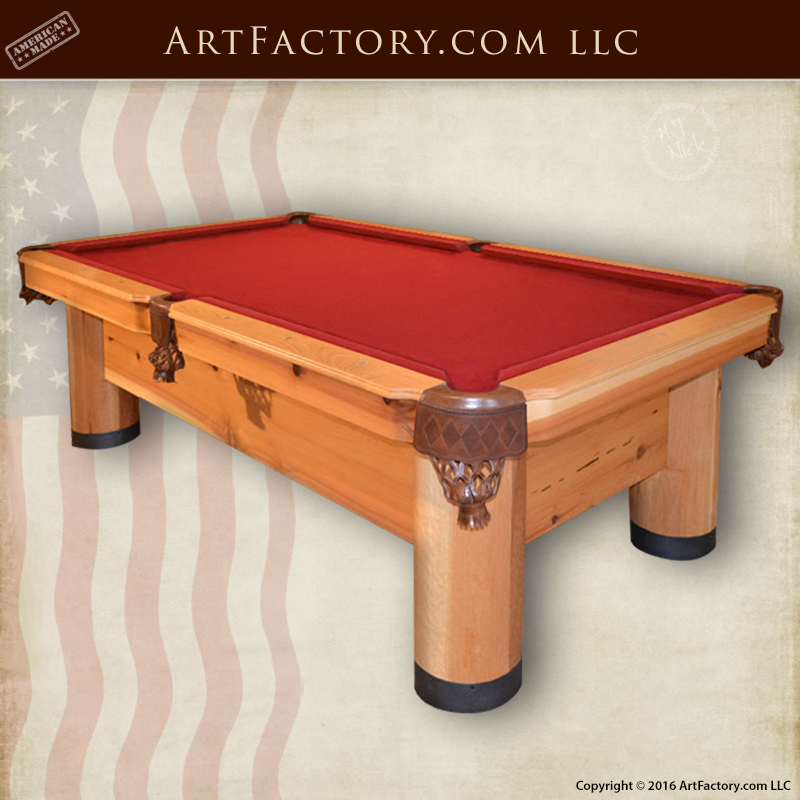 Further customize your solid wood furniture with hand carved designs and decorative hardware, the choices are endless when you order your custom handmade pool tables and game room furniture from ArtFactory.com. Call us to discuss your project and custom game tables at 1-800-292-0008.